The world is changing and people are constantly looking for better and simpler sources of lighting compared to traditional powered lights. Solar lanterns are one of the alternative sources of light that fit the description above. In this article, we will be writing about these lights comprehensively and also be reviewing some of the best solar lanterns available. 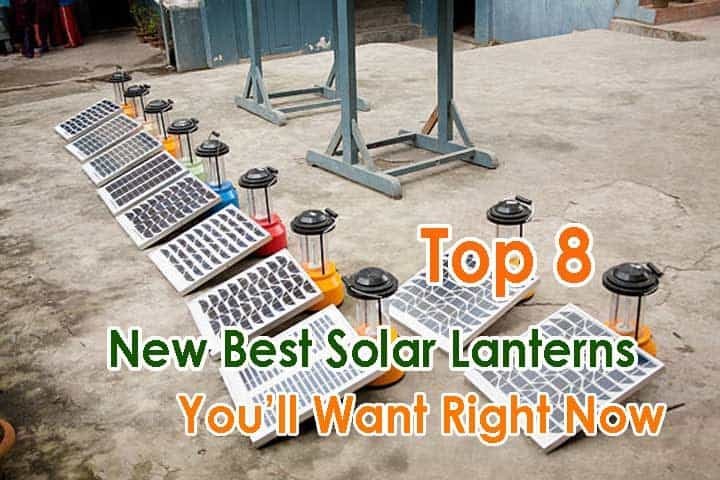 How Do You Find the Best Solar Lanterns? Searching for the best solar lantern can be a daunting task and if you do not take your time, you might end up choosing the wrong one. This is why we will be highlighting the various factors you should consider before choosing one in subsequent paragraphs. Solar lanterns can be used either indoors or outdoors and this information must be taken into consideration. 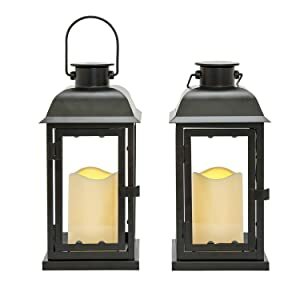 You should consider where you are going to be installing the lanterns or how you are going to install them before making a purchase decision. For lights that will be installed outside the home, ensure that you choose lights with installation hardware. Also, if it is a lantern you want to place on tables or along a handrail, then you do not need installation hardware. Just ensure that you choose the light with hardware that suits your purpose. It is preferable to go for solar lanterns that are easy to install. This is because you save time and energy installing them. You also do not have to call in professionals to do the work which might cost you additional money. One of the most important features to consider when purchasing a solar lantern is its luminosity or scope of light. Everyone has different preferences in light and you have to choose the brightness of the lantern according to your preference. If you want very bright lights, look for lights with higher lumen rating and if you want dim lights, choose lanterns with lower lumen rating. The lumen rating will also determine the range or scope of light. This is because of the brighter the light, the more ground it is likely to illuminate. Not all solar lanterns can run through the night and not all solar lanterns charge at the same pace. To enjoy your lanterns, ensure you choose the ones that charge in no time. This is particularly important for days when there isn't enough sunlight. Also, ensure you choose lights with longer running time as this makes you enjoy the light more. The running time is usually indicated on the lantern, so all you need to do is to check. If you are going to be purchasing solar lanterns for outdoor purpose, then you should ensure that the one you choose is weatherproof. This is because without weatherproofing, the lantern will not last long due to the adverse weather condition like too much rain, sun or snow. 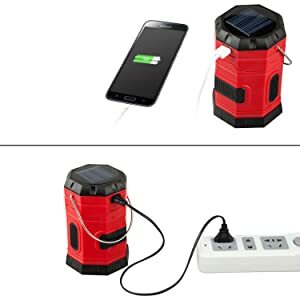 Nowadays, solar lanterns have power bank features for charging phones in case of emergency situation. 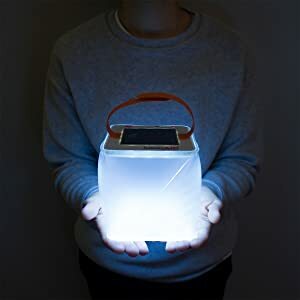 If the reason you are going to purchase a solar lantern is because you need lighting on your camping expedition, then you should that you choose one with a power bank. Depending on the occasion, the size of your solar lantern is very important. If you are going for backpacking, then it is advisable to go for small lanterns that are collapsible. These types of lanterns are easier to carry in the backpack and they also add little weight to the existing load. For occasions like camping, smaller and collapsible lanterns are also advised because they are easy to carry. 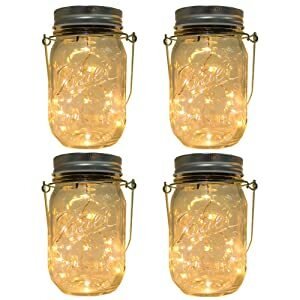 On the other hand, the smaller lanterns are not easy to use. This is because bigger lanterns can be hung anywhere with ease compared to smaller ones. In the end, you just have to choose the type lantern you want based on the occasion you need it for. There are thousands of solar lanterns available for purchase in the market and it might be difficult to find the right one. This is why we have taken it upon ourselves to pick some of the best solar lanterns available and reviewed them for you below. The Suaoki LED camping lantern is a lantern suitable for all your camping and hiking expenditures. One of the most interesting features of the lantern is that it is totally collapsible which makes it easier to pack for hiking and camping. Also, the light features a two-way charging system which is through solar and a USB port. The solar panel is environment-friendly and just in case there is not enough sunshine to charge the solar panel, then the USB port can serve as backup. Furthermore, the light has 3 different light modes which are; low light, high light mode and SOS blinking brightness mode. Apart from giving you a variety of option to suit your needs, you also get to preserve your battery by choosing the low light mode. The expandable and compressible feature is innovative because apart from making it easy to pack the light, the lantern turns into a flashlight when compressed. The Suaoki Company installed a smart protection chip in the lantern. This chip prevents the lantern from getting overcharged and also ensures that over-circuiting doesn’t happen. This further makes the lantern safer to use. Finally, the light has a clover design which helps to increase the range of the light. The TANSOREN Solar lantern is a powerful LED light that provides immense bright light for the user. It has a total light output of 180 lumens which is more than enough light to brighten your space in the camp. The other features of this light are impressive and one of them is it has 3 power supply options. The options include; built-in rechargeable batteries, solar and 5V DC USB charging. These options are particularly important because, with them, there is little chance for the light to run out of juice. Furthermore, it has a USB port that can serve as a backup charger for your android phones. 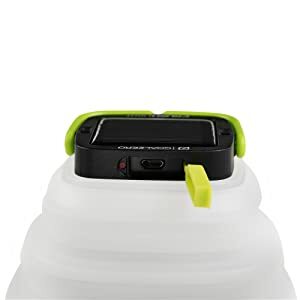 This feature is a great addition because when you are out camping, you might not get electricity or energy to charge your device and this can help in emergency situations. However, you have to note that it cannot charge Apple devices. Also, the light is lightweight and it has a collapsible design that makes it compact and easy to carry. In addition, the light can last for up to 8 hours and it is designed to be energy saving. For durability purpose, the light was hand built with military grade plastics. 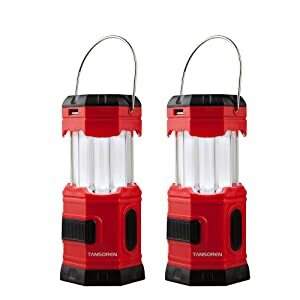 The lanterns are also water resistant which means you do not have to worry about leaving them in the rain when camping. Finally, the light is a 360 degree LED lamp which means with the light, every angle of the area gets illuminated. The LVJING solar LED Lantern is a light with a colour temperature of 3000 kelvins. The light is small, compact and it weighs 7 ounces which makes it easier to carry about. It is well suited for outdoor purposes and it has a metal clamp which enables you to hang the light in places of your choice. Also, the light has a weatherproof IP44 feature which means that regardless of how harsh the weather condition is, the performance of the light will not be affected. The weatherproof feature also ensures that the lantern lasts longer. Furthermore, the light has a flickering candle effect that gives away a sweet ambience. In addition, the auto on and off feature lets the lantern charge itself when the sun is out and turn on when it is getting dark. The light has a charge time of 5 hours when placed under direct sunlight and it can last for up to 9 hours when fully charged. Note that the light is not very bright and it is better suited for decoration. 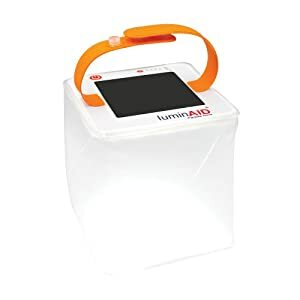 The LuminAid Solar Inflatable Lanterns is one of the best inflatable lanterns around. It is extremely lightweight and it literally doesn’t affect your load which makes it ideal for camping and hiking. The light folds flat to under 1 inch and it weighs less than 5 ounces. In addition, the light has a waterproof IP67 feature which makes it ideal for use outdoors. The light can also float on water which is a really cool feature. Furthermore, the light makes use of solar energy which means that you will be preserving the planet by using this renewable energy powered light. One bad feature of this lantern is it takes approximately 10-14 hours to charge which is a long time. But, it tends to last for 10 to 24 hours after a single charge. However, you must make sure that the battery doesn't get too low before recharging because if it does, it might not hold a charge for long again. With a light with a total output of over 50 lumens, you are assured of getting the surroundings well lit. Finally, LuminAid Solar lanterns are dustproof which means that they retain their fresh look for a long time. Looking for a beautiful and realistic solar lantern? 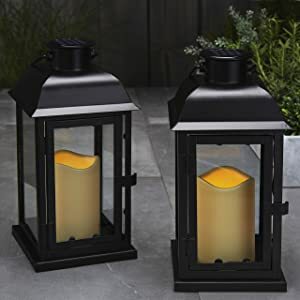 Then the Lamplust outdoor black solar candle lantern is the right one for you. It has double black metal and glass lanterns with a solar candle with an ivory resin finish. The lamplust lantern is designed in such a way that it looks like a real flame. This is evident by its warm flickering flame. The lantern is not only suitable for outdoor uses, but it is also good for indoors and it also has an aesthetic look. Furthermore, the light has an efficient solar panel that allows the light to get charged quickly. This is made possible due to the solar panel of the light being situated on top of each of the lanterns. 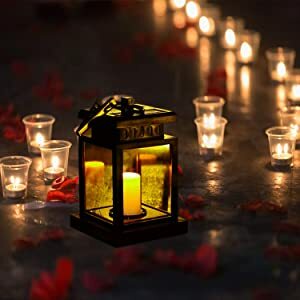 The lanterns are also made from high grade a weatherproof material which means that regardless of the weather condition, the light will work perfectly. Another feature we like about this lantern is the extendable handle it has which makes it easier to carry. The lantern also comes with 1 rechargeable 1.2V, 600 mAh Ni-Mh battery which means that you get to use the lantern immediately you purchase it. Finally, the lamplust company are known for having good customer relation, just call them in case you have any problem with the product. CHBKT Solar light is a unique solar lantern designed with a scaled pattern glass jar. The body of the lantern is specifically attractive and strong. It glows warmly and it adds a romantic feeling to anywhere it is being lit. 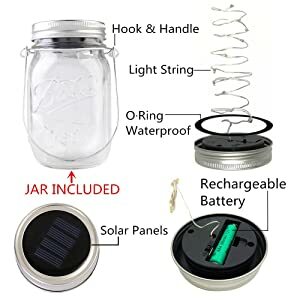 Because of this strong jar, you are assured of having a long-lasting solar light that is easy to handle. In addition, the light is 100% solar powered which means that when using the light, you are also helping to preserve the planet. This also makes the light easy to set up because of the absence of wires which makes things complicated. Furthermore, in case of insufficient sunshine, the light comes with an AAA rechargeable battery for back up. In addition, the light has a light sensor that turns on the light automatically when it is getting dark and off when it is dawn. This helps to reduce the stress of having to manually turn the light on. Also, the light has an integrated IP65 waterproof feature which means you get to use the light even if it is raining cat and dogs. This feature ensures that the light lasts longer. Finally, the light can be used for many things ranging from using as outdoor lighting to using it as decoration in events. We would have liked if the light is brighter but the light is still an amazing product regardless. As a hiker or a camper looking for solar lanterns to carry on your adventure, then you should definitely consider the Goal Zero Crush Light. This is due to the fact that this light is lightweight and it is collapsible making it easier to carry and fit into backpacks. In addition, the lantern has a total lumen output of 60 which means that you get enough light to illuminate the area. Also, the lantern has flickering candle mode which makes it aesthetically pleasing to look at. In addition, the lantern has two light modes which are the high and low mode. When the light is set on low mode, you can get to use the light for up to 35 hours which we can all agree that it is impressive. 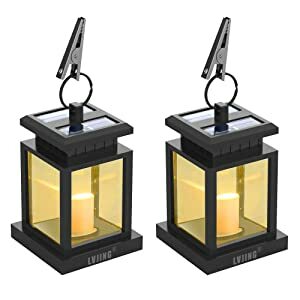 Furthermore, the lantern can also be charged with the use of a USB cable which is included in the package of the lantern. However, you have to note that the lantern is best charged with direct sunlight. The lantern has a total output of 60 lumens. 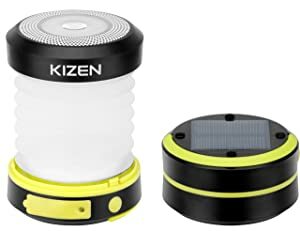 The Kizen solar-powered lantern is a bright light that is well suited to camping activities. The light has an impressive space saving design which allows the light to be folded into almost 3 times smaller than its full size. With this light, you do not have to worry about the light taking up space in your luggage. Also, when the lantern is folded, it can serve as a flashlight. In addition, the light has two different charging sources which are through a USB port and through solar. This means that even if the sun doesn't come out, you have a backup way to get the light charged. Furthermore, the light can also serve as a backup power bank for your phones in case of emergency. Although the lantern is incapable of fully charging your phone, you can rest assured that it will charge it enough for you to make that important phone call. Also, the lantern has 3 lighting modes namely; High mode, low mode and SOS mode that can be used in case of emergency. 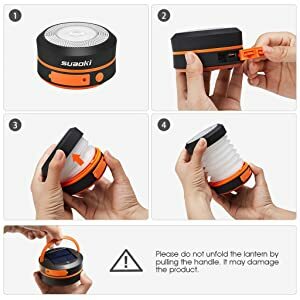 Another interesting feature of the Kizen solar-powered lantern is its smart circuitry feature that prevents the lantern from overcharging. This feature is important because often times than not when overcharging occurs, it can blow the circuit of the light. Finally, the manufacturers promised a lifetime warranty on their product thereby giving the customer confidence on their purchase. Question: What is the best condition to charge a solar lantern? Answer: The best condition to charge is when there is a high UV index. However, a sunny day does not usually mean there’s a high UV index. To know when the UV index is higher, you can get weather forecast apps like Accuweather. Question: How can I know that my solar lantern is receiving direct sunlight? Answer: The lantern is receiving direct sunlight when there is nothing blocking the rays of the sun from hitting the solar lantern. For example, the sun hitting the solar lantern through a transparent window doesn’t mean the sun is shining directly on the lantern. To get direct sunlight, you have to eliminate this obstacle completely. Also, some of the new solar lanterns have indicators that show if the lanterns are being charged efficiently. Answer: Yes the lantern will lose its charge but it will be at a very slow pace. On average, the solar lantern will only lose about 5% of its charge every month it remains unused. We have come to the conclusion of this article and we are sure that you have learnt about the benefits of using solar lanterns. We also ensured that we wrote about the factors to consider before purchasing a solar lantern. We are sure that if you follow the tips we wrote about, you will definitely purchase a good solar lantern. We also made sure we reviewed some of the best solar lanterns available for you. 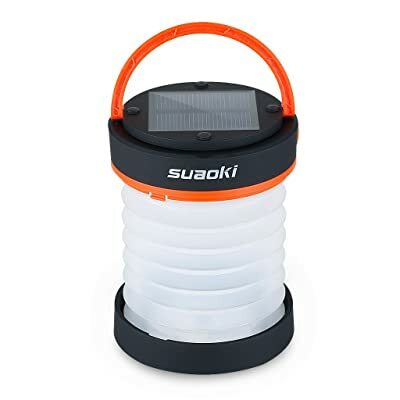 After our review, we concluded that the Suaoki LED camping lantern is the best from the lot. This is not to say that the other lanterns are of low quality but the Suaoki LED lantern is just head and shoulders above the rest. This decision was made based on the lantern's smart protection chip, its different lighting and charging modes, bright lights and durability. 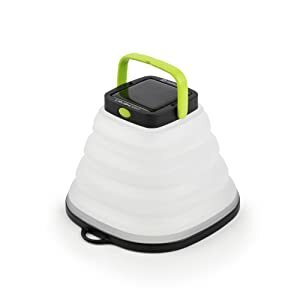 One of the most interesting features of this lantern is that it is totally collapsible which makes it easier to pack for hiking and camping. Also, the light features a two-way charging system which is through solar and a USB port. The solar panel is environment-friendly and just in case there is not enough sunshine to charge the solar panel, then the USB port can serve as backup. Furthermore, the light has 3 different light modes which are; low light, high light mode and SOS blinking brightness mode.